What began as a way for the local twin and triplet club to exchange gently used clothing and baby items, has grown into a sale known to most parents of young children in Essex County. Now 20 years later, look what we’ve become! 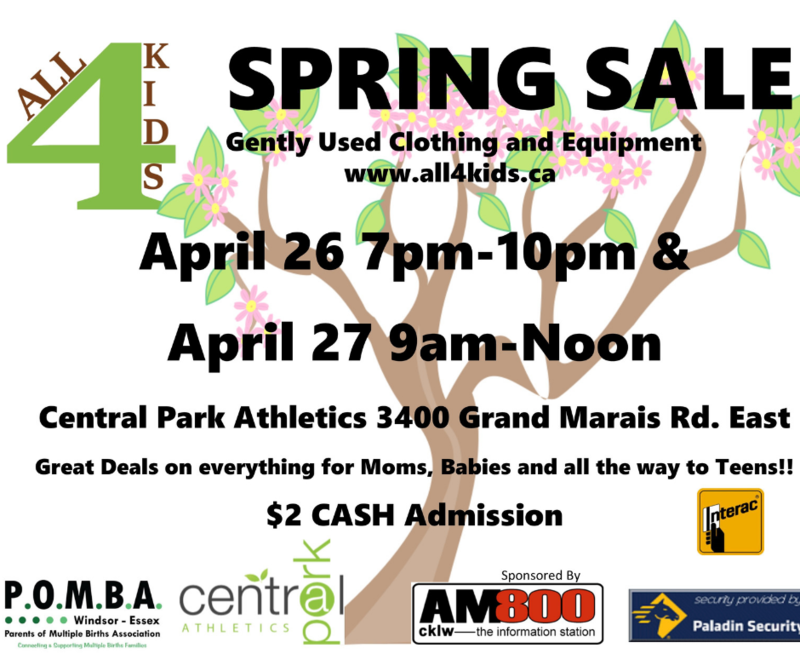 Presented by the Windsor and Essex County Parents of Multiple Births Association, a local not for profit organization, with the generous support of Central Park Athletics, the ALL4KIDS sale now boasts in excess of 90 vendors. Everything from maternity wear, preemie and infant clothes, boys and girls clothing, shoes and accessories, toys, books, games, bikes, car seats, strollers, cribs and baby furniture can be found here. This sale is a “must attend” for every family setting up their nursery or buying another something to leave at daycare or “grandma’s”. The fact that the majority of the sellers have twins or triplets in their family, makes this the perfect place to find those hard to find items. Double strollers, matching outfits and lots and lots of everything. Our “department store” setup allows shoppers to be directed to exactly what they need. Boys and girls clothing are all hung on hangers, and are on racks, sorted by size and gender. This is just one more thing that makes this unlike any other yard sale. For your convenience we offer a holding room so you don’t have to walk around with your large items while you continue to shop. Our items are priced to sell and with our “no haggle” policy, customers know how much they will be saving. Our convenient one stop check outs are set up away from the busy shopping areas, and provide a smooth payment process and even allow for debit transactions. The ALL4KIDS sale also gives back. Admission is $2 and Children are free. When the sale is over many of our sellers donate their unsold items to charity. If you have clothing or children’s items for donation, feel free to drop them off with us. Items will be picked up by the charities after the sale. So come and check us out. On Saturday most items are 1/2 price!! What a deal. See you there and bring a friend! !